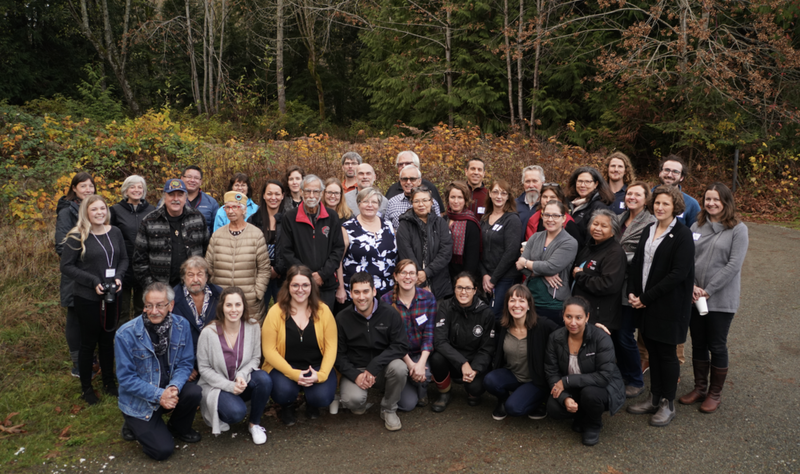 From November 20-23, representatives of Canada’s 18 UNESCO biosphere reserves came together in the Mount Arrowsmith Biosphere Region on the east coast of Vancouver Island for a national gathering hosted by Kwalikum and Snaw-naw-as First Nations. The 2018 Fall Gathering of the Canadian Biosphere Reserves Association (CBRA) had two key objectives: Building ethical space between CBRA's board of directors and Indigenous Circle, and developing a collective and strategic vision for this important national UNESCO network. On the right, Tsumkwatun (Councilor Lawrence Mitchell, Snaw-naw-as First Nation) sings a song with his daughter (left) after hosting a meal for CBRA on behalf of the Nation. In a country as large as Canada, biosphere reserves are geographically, biologically, and culturally diverse, but all work toward achieving similar goals and addressing common challenges. CBRA's 2018 Fall Gathering was designed for board members, staff, and Indigenous hosts of Canadian biosphere reserves to share knowledge, hear individual stories of struggle and success, and build trust. Truth, reconciliation and co-leadership with Indigenous Peoples are essential for Canada's biosphere reserves to thrive with integrity. The entire gathering was held in circle––large and small––allowing all 45 guests to speak and listen to each other. Participants learned about local First Nations customs around ceremony, such as welcome prayers, songs, dances, and gift-giving practices, making conscious space for Indigenous and western traditions of knowledge sharing to co-exist. Working in ethical space, a collective vision was communicated––a vision that will guide CBRA in its work to address national and global issues by supporting sustainable development, biodiversity conservation, climate change adaptation, and social justice. Thanks to Snaw-naw-as First Nation for their warm welcome on Thursday during the CBRA Fall Gathering in their territory. 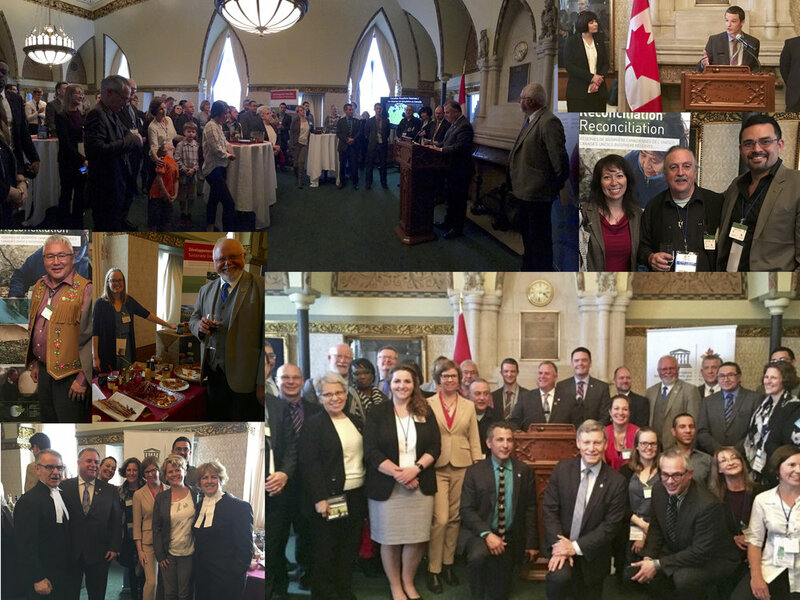 We're proud to have two biosphere reserves in Courtenay-Alberni and enjoy hosting the annual Biosphere Day on the Hill. Great comradery, food, dancing and singing. Congratulations both to the Nation and the CBRA for such a wonderful gathering and for such an important movement. CBRA's new strategic plan will be launched in early 2019. 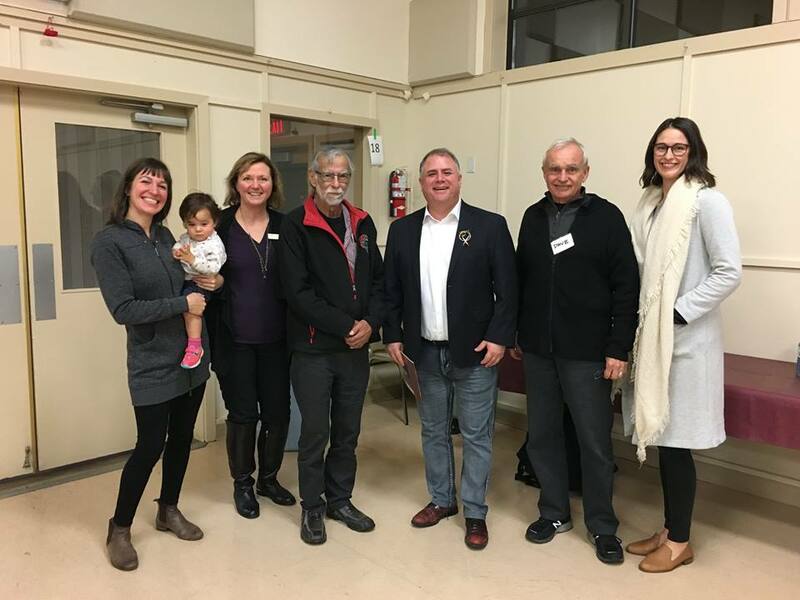 Members of the Canadian Biosphere Reserves Association’s (CBRA) Board of Directors and Indigenous Circle, as well as biosphere reserve staff and guests. La Malbaie, Quebec—In an effort to limit the environmental impact of the G7 Summit in La Malbaie, Quebec, in June, the Government of Canada has entered into an agreement with the Corporation de la Réserve de la biosphère de Charlevoix to make this summit an environmentally responsible event. The Honourable Jean-Yves Duclos, Minister of Families, Children and Social Development, together with Jean Fortin, administrator of the Corporation de la Réserve de la biosphere de Charlevoix, today announced that the Government of Canada will invest $325,000 in various activities to reduce the G7 Summit’s environmental footprint and to draw from the Corporation de la Réserve de la biosphère’s expertise in terms of environmental responsibility and sustainable development. One of the highlights of this agreement will be the planting of 100,000 trees on the Réserve de la biosphere de Charlevoix and on 13 additionnal Canadian biosphere reserves, from British Columbia to Nova Scotia to take place in May. This initiative will help replenish, restore or reforest sites chosen by the participating local communities, and to offset some of the greenhouse gases from the G7 Summit. The Corporation de la Réserve de la biosphère de Charlevoix will also support Canada’s efforts to integrate good environmental practices into the Summit’s overall organization, supported by the Bureau de normalisation du Québec’s “sustainable event management” 9700 253 certification. Special attention will be paid to reducing waste, especially plastic. Canada has made climate change, oceans and clean energy one of the central themes of its 2018 G7 Presidency. This collaboration is a concrete way of putting words into action. La Malbaie (Québec) – Soucieux de limiter l’impact sur l’environnement de la tenue du Sommet du G7 à La Malbaie au Québec en juin prochain, le gouvernement du Canada a conclu une entente avec la Corporation de la Réserve de la biosphère de Charlevoix, afin de faire de ce sommet un événement écoresponsable. Le ministre de la Famille, des Enfants et du Développement social, l’honorable Jean-Yves Duclos, a annoncé aujourd’hui, en compagnie de Jean Fortin, administrateur de la Corporation de la Réserve de la Biosphère de Charlevoix, que le gouvernement du Canada investira 325 000 dollars dans diverses activités qui permettront de réduire l’empreinte environnementale du Sommet du G7, et de mettre à profit l’expertise de la Corporation de la Réserve de la biosphère de Charlevoix en matière d’écoresponsabilité et de développement durable. L’une des activités phares de cette entente sera la plantation en mai prochain de 100 000 arbres dans la Réserve de la biosphère de Charlevoix et dans treize autres réserves de biosphères canadiennes, de la Colombie-Britannique jusqu’à la Nouvelle-Écosse. Cette initiative contribuera à végétaliser, restaurer ou reboiser des sites choisis par les localités participantes, en plus de compenser une partie des émissions de gaz à effet de serre liées à la tenue du Sommet du G7. La Corporation de la Réserve de la biosphère de Charlevoix soutiendra aussi les efforts du Canada visant à intégrer de bonnes pratiques environnementales dans l’ensemble de l’organisation du Sommet, ce qui sera attesté par la norme Gestion responsable d’événement 9700 253 du Bureau de normalisation du Québec. Une attention particulière sera accordée à la réduction des déchets, y compris un usage réduit du plastique. Le Canada a fait des changements climatiques, des océans et de l’énergie propre l’un des thèmes centraux de sa présidence du G7 en 2018. Cette collaboration est une façon concrète de lier la parole aux gestes. 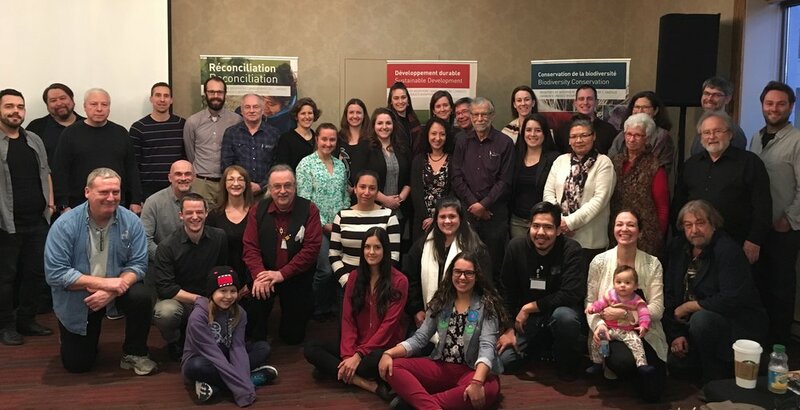 Last week, staff, board members, and Indigenous delegates from across Canada’s 18 UNESCO biosphere reserves met in Ottawa for a briefing on OECMs. Presentations were given by Nadine Crookes, co-chair of the National Steering Committee for the Pathway to Canada Target 1, Danika Littlechild and Eli Enns, co-chairs of the Pathway’s Indigenous Circle of Experts, Larry McDermott, the Algonquin Elder associated with the Pathway’s National Advisory Panel, and CBRA staff and consultant Monica Shore and Kate Potter. Indigenous delegates gathered for a special meeting on how CBRA can move forward in the spirit and practice of reconciliation through this project and in its everyday operations. The group crafted a document called CBRA’s Indigenous Circle Statement - “Making a Promise.” A 5-7 minute documentary is also being produced with reflections from Indigenous delegates and will be broadcast online in June. La semaine passée, le personnel, les membres du conseil d'administration ainsi que les délégués autochtones des 18 réserves de la biosphère canadiennes de l’UNESCO se sont réunis à Ottawa pour discuter des OECM et du rôle de l’ACRB par rapport à l’Objectif 1 du Canada. Des présentations ont été effectuées par Nadine Crookes (coprésidente du Comité directeur national de l'Objectif 1), Danika Littlechild et Eli Enns (coprésidents du Cercle autochtone d’experts de l’Objectif 1), Larry McDermott (aîné algonquin associé au Comité consultatif national), Monica Shore (employée de l’ACRB) et Kate Potter (consultante de l’ACRB). Les délégués autochtones se sont rassemblés lors d'une rencontre spéciale afin de regarder comment l’ACRB peut aller de l'avant dans l'esprit et la pratique de la réconciliation, tant à travers ce projet qu’au cours de ses opérations quotidiennes. Le groupe a rédigé un document intitulé « Déclaration du cercle autochtone de l’ACRB: engagement solennel ». De plus, un documentaire de 5 à 7 minutes incluant les réflexions des délégués autochtones est en cours de réalisation et sera diffusé en ligne en juin prochain. Our CBRA family and the broader Biosphere Reserve community just lost one of its most influential contributors, a founding father and a pioneer. At the age of 93, Dr. Fred Roots passed away unexpectedly and peacefully on October 18 2016, at his home in East Sooke on Vancouver Island in British Columbia. His legacy to UNESCO's Man and the Biosphere (MAB) Programme and to everything he has been involved in, here and abroad, is without comparison. After earning his PhD at Princeton, he joined Britain’s Scott Polar Research Institute and was chief geologist on a three-year international expedition to Antarctica that found the first evidence of the global phenomenon we now know as climate change. It was only the start. Since then, his life has been an unbelievable addition of polar expeditions, discoveries, major scientific input (over 300 scientific papers and reports), conferences (including one attended by Albert Einstein! ), game-changing involvement and so on. He inspired and impacted so many people and organizations over his life, and will continue to do so. Fred created the Canadian MAB programme in the late 1960s, chaired it for decades and was still corresponding with us on a regular basis until his final days. He represented our country for so long at the UNESCO MAB International Coordination Council that the Chairman was used to say «Fred» instead of «Canada» in his statements. We can truly thank him to have such a network of 18 biosphere reserves across this country today. His loss is such a shock as he was literally letting us think he was immortal. Even at over 90 years old, he was aboard the last 2 Students on Ice’s Arctic expeditions, taking part of all the hikes, workshops, giving interviews, tireless at explaining and educating youth, working on a new paper until late at night and giving a talk about it next morning. The energy of Fred Roots was just out of this world. On a more personal note, I would like to say that Fred had a crucial role in making me feel truly inspired about MAB when I entered into this Biosphere endeavour. He had this skill and dedication to transmit passion. He wrote in Manicouagan’s designation review that «Biosphere reserves are the main tools with which UNESCO can fulfill its responsibilities on the ground, to help us understand what is happening to us, to our planet, and to demonstrate how to live more sustainably». His words are still fuelling the whole team. We now have to continue the journey with him in our minds and hearts. On behalf of CBRA, we’ll miss you Fred! Notre famille CBRA et la grande Communauté des Réserves de biosphère viennent de perdre l’un de nos collaborateurs les plus influents, un de nos pères fondateurs et un pionnier. À l’âge de 93 ans, Dr Fred Roots est décédé de façon inattendue et paisible, le 18 octobre dernier à son domicile de East Sooke, en Colombie-Britannique. Son héritage au programme MAB et à tout ce dans quoi il s’est impliqué, ici comme à l’étranger, est tout simplement énorme. Après avoir obtenu son doctorat de Princeton, il a rejoint la Scott Polar Research Institute de Grande-Bretagne comme géologue en chef d’une expédition internationale de trois ans en Antarctique, qui a trouvé les premières preuves des phénomènes mondiaux que nous appelons maintenant les changements climatiques. Ce n’était que le début. Depuis, sa vie a été un cumul incroyable d’expéditions, de découvertes, de grandes contributions scientifiques (plus de 300 articles scientifiques et rapports), de conférences (dont une en présence d’Albert Einstein! ), d’implications décisives et ainsi de suite. Il a inspiré et touché tant de gens et d’organisations au fil de sa vie, et continuera de le faire. Il a créé le programme MAB canadien à la fin des années soixante, il l’a présidé pendant des décennies et correspondait encore avec nous sur une base régulière. Il a représenté notre pays pendant si longtemps au Conseil international de coordination du MAB de l’UNESCO, que le Président avait l’habitude de dire «Fred» au lieu de «Canada» dans ses déclarations. Nous pouvons vraiment le remercier d’avoir, aujourd’hui, un tel réseau de 18 RB dans ce pays . Sa perte est un choc énorme. Il nous avait littéralement laissés croire qu’il était immortel. Même à plus de 90 ans, il était à bord des 2 dernières expéditions de Students on Ice en Arctique, prenant part de toutes les randonnées, ateliers, donnant des entrevues, infatigable à expliquer et éduquer les jeunes, travaillant sur un nouveau document jusque tard dans la nuit et donnant une conférence à ce sujet le lendemain matin. L’énergie de cet homme était tout simplement inexplicable. Sur une note plus personnelle, je voudrais dire que Fred a joué un rôle crucial dans mon engagement envers le MAB quand je suis entré dans le circuit. Il avait le talent et le dévouement pour transmettre la passion. Il a écrit dans l’évaluation de la désignation de Manicouagan que «Les réserves de biosphère sont les principaux outils avec lesquels l’UNESCO peut remplir ses responsabilités sur le terrain, afin de nous aider à comprendre ce qui se passe pour nous, pour notre planète, et pour démontrer comment vivre de manière plus durable». Ses paroles alimentent encore toute l’équipe. Nous devons maintenant continuer le voyage avec Fred dans nos esprits et nos coeurs. Au nom de CBRA, Fred, tu vas nous manquer!